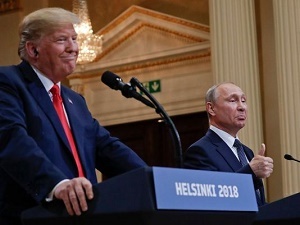 Russian President Vladimir Putin finally admitted something that has been obvious to anyone but fans of President Donald Trump who’ve trained themselves to believe, or at least parrot, the denials of their God Emperor. Putin wanted Trump to become president of the United States. That Putin sought to elect Trump has long been clear to our intelligence agencies. And though Russian interests have now been indicted for “large scale cyber operations to interfere with the 2016 U.S. presidential elections” the efforts also focused generally dividing Americans by sewing “distrust towards the candidates and the political system in general." Dividing Americans over race is also the true art of Trump’s deal. By demanding the first black president’s papers, he found a path into politics that he’d been seeking since at least 1988. “As someone possessing perhaps the best raw political instincts of any Republican in his generation, Trump had intuited, correctly, that a racist attack targeting a black president was the surest way to ingratiate himself with grass-roots Republican voters,” Joshua Green wrote. While mainstream Republicans shrugged off birtherism, vast majorities of the GOP favored the theory that Obama had faked his own birth, even eight years into his presidency. In 2015, likely inspired by Ann Coulter, Trump’s instincts took his racism to new levels labeling all but “some” Mexican immigrants as criminals and rapists. Again Trump tapped into fire over changing demographics among the Republican Party's white base that few national Republicans were willing to blatantly poke. His campaign skyrocketed and GOP establishment attempts to broaden it crumbled; its decades of building a majority by winning the South had made its voters extraordinarily susceptible to Trump’s barely veiled racism. Trump was not once confronted about his birtherism during the dozens of GOP debates — likely because his opponents realized the attack would hurt them politically more than Trump. His mission was to win by finding “missing white voters” in the so-called Rust Belt. And with Putin’s help, it worked. During his recent trip to Europe, Putin’s investment in Trump paid off its most massive returns, and not just because Trump is fraying the NATO alliance in ways no Russian or Soviet leader ever could. Trump also attacked immigration in Europe as “changing the culture,” echoing Europe’s far right populists. Combine this race-based attack on immigration in general with Trump’s defense of Nazis and Klan members who marched in Charlottesville and it’s obvious that not since Woodrow Wilson screened and celebrated "Birth of a Nation," D.W. Griffith’s glorification of the Klu Klux Klan, at the White House has any American president done more to give white supremacists aid and comfort. Now America’s race problem has become a national security problem, enabling the most effective attack on our democracy by a foreign power in our history. Race is America’s Achilles’ heel. Putin and Trump have grabbed us by it. And we need to perform a heel transplant now, in mid sprint. That won’t be easy, but Democrats who’ve struggled with how to appeal to the minority of white voters who helped elect Barack Obama without abandoning the people of color who make up their stalwart base should recognize that abandoning racial politics to Trump at this moment isn’t just cowardly and ineffective. It’s dangerous.